Also see the AdWords Keyword Planner Review, Google’s free keywords research tool that supplies monthly traffic figures. What Does Übersuggest Keyword Research Tool Do? When we do a search in Google for single keywords and relatively short keyword phrases (and sometimes for very long tail SERPs) Google will give predictive suggestions as you see in the screenshot to the right for the Google search “Keyword Research Tool”. 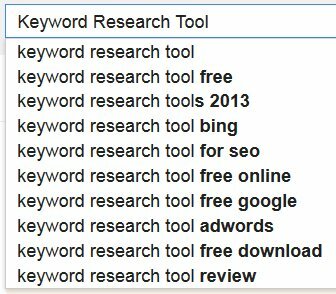 The Google suggestion/predictions can provide us with a quick insight into what potential visitors are actually searching for, for example from the Keyword Research Tool predictive suggestions I see “Keyword Research Tool Bing” which is a SERP I might have not considered targeting. I tend to think about Google traffic, then Google traffic, followed by erm, Google traffic :-) Really easy to make that SEO mistake and forget about Bing SEO and Yahoo SEO, been doing this over 10 years and I still do it. They go all the way from A to Z and 1 to 0 IF there are results for those letters/numbers, if not you get less results. Having the SEO tools results all on one page is awesome, makes finding suggestions for derivative and related SERPs a lot easier. The free SEO tool goes one step further, for each result you can expand it further (click the phrase) to see the basic predicted keyword results for that search as well, see the screenshot to the right. 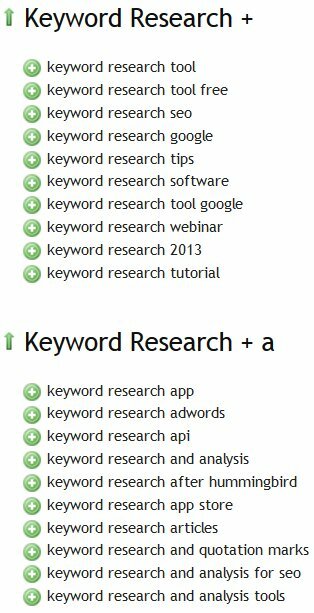 As you can see there are lots of suggestions related to keyword research for this article I’ve written and I’ve included some of them. A word of warning, the results don’t give any real idea of SEO value of the SERPs, there’s no traffic numbers, no idea of competition for each SERP, you’ll still need to perform competitive analysis on the phrase. And there is a tendency to only include results starting with the phrase typed, in my example search we don’t see “Google Keyword Research” or “SEO Keyword Research”, most results start “Keyword Research ….” which means we aren’t necessarily seeing the best phrases.. Consider this your first step in finding the best keyword phrases to target an article on or just derivatives to include as you target a main SERP. The latter (competitive analysis) is partially included above and I’ll include the Hummingbird SERP later, doesn’t mean I’ll get any relevant SERPs, but no harm including those phrases (might be lucky). Stallion Responsive includes a way to add relevant keyword phrases to a WordPress article, the SEO concept is to choose a main SERP like: “Keyword Research Tool” (sort of SERP this SEO article might be found for) and find semantically related or derivative SERPs to support it. Most people reading this won’t be familiar with the Stallion Responsive Keyphrases feature, so here’s a little background on this awesome SEO feature that’s great for the new Google Hummingbird algorithm (see, I’m covering the Hummingbird SERP now). 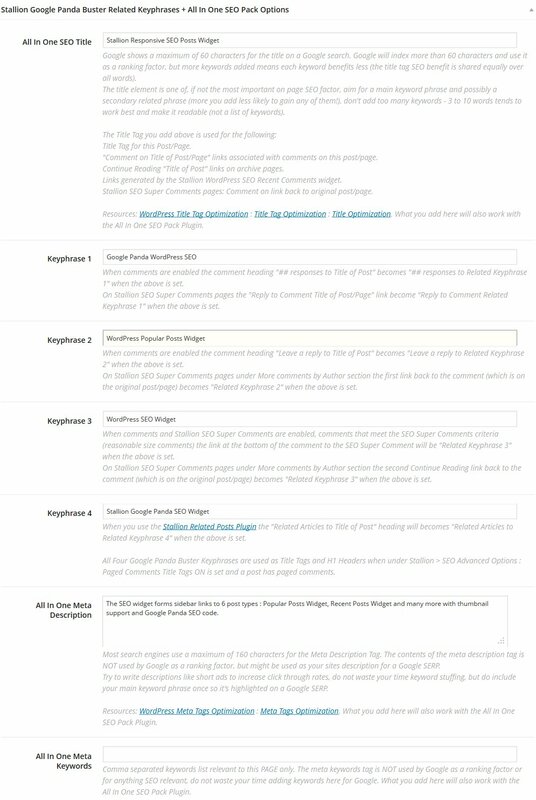 When you create or edit a post in WordPress with Stallion Responsive active you’ll have 6 places to add keyword phrases, click the image to the right to see a full screenshot of the Stallion Responsive Hummingbird SEO feature. ** That’s where you add your post title (default WordPress). ## This is a Stallion Responsive feature, but it can use the title tags added by those two WordPress SEO plugins (I’ve used the same database structure so. For the All in One SEO Title or Yoast WordPress SEO Title I’ll target the mia SERP, this title is used as the pages title tag and main H1 heading, so is very important SEO wise. There are many alternatives I could have used, could have targeted the “SEO Tools” related SERPs for example. Only so much you can SEO a single article for, if I want to take a real crack at the SEO tools SERPs I’ll need to write more articles or cover them in comments: can use the Stallion Responsive SEO Super Comments feature to target specific SERPs via comments, I’ll try to add an example as a comment. The original WordPress title, All in One SEO Title or Yoast WordPress SEO Title and the Keyphrase 1 to 4 are used by Stallion Responsive through out the site. 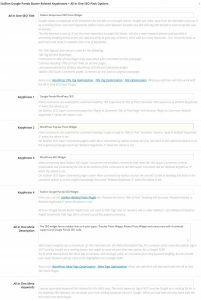 You’ll find those phrases used for headings on this page, anchor text for links from various widgets and anchor text for links from archive parts of the site (categories etc…). The SEO benefit of this is Google has been moving towards understanding natural language for sometime and their new Hummingbird algorithm is another step in that direction. If you use the Stallion Responsive keyphrases as I do when Google indexes your site it will find a variety of anchor text (and alt text) used for internal links. 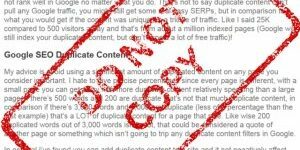 Rather than this article only being linked with the anchor text “Free Übersuggest Keyword Research Tool” (the original WordPress title, which is the best you can expect from other WordPress themes, many use “Click Here” for some links! ), with Stallion many links are using the All In One SEO title/Yoast WordPress SEO Title and the 4 Stallion Keyphrases. Since Google Hummingbird is looking for natural language patterns more than ever before having different anchor text used for internal links is a tick in the right SEO box. Add to this when other webmasters decide to link to your articles, they might use the alternative keyphrases you’ve used rather than always using the best SEO title tag. Again this appears far more natural than most links using perfect SEO’d anchor text. It’s a lot of work using the Stallion Responsive keyphrases, but that’s how we have to approach Google SEO 2014. As I mentioned in the main article I can use the Stallion Responsive SEO Super Comments feature to target other SERPs like the related SEO tools SERPs. 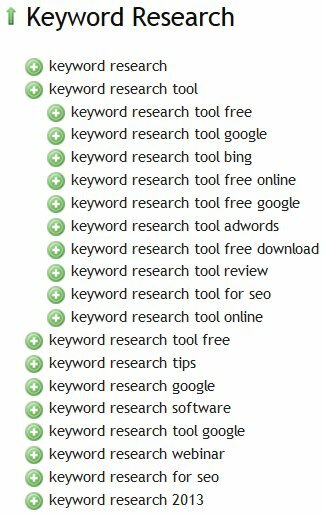 I like the free Übersuggest keyword research SEO tool a lot, I do have a feature request suggestion. After doing a Google search you’ll find a “Searches related to Keyword” at the bottom of the Google results. I would like to see these related searches included with the Übersuggest results. And the title is used to link to link to the Stallion Responsive SEO Super Comments version of this comment which uses the comment title as the title tag. When Google indexes this comment, and it will index the comment in it’s own right as a separate article it will have the title tag “Keyword Research SEO Tools like Market Samurai” and might rank for relevant SERPs. Right now (March 2014) comments from this site are ranking top 10 in Google. This site wouldn’t have those SERPs without the Stallion Responsive SEO Super Comments. Remember these are comments, can only add limited SEO to a comment, so it’s not as well SEO’d as a WordPress Post or static Page: there’s no links directly to the super comments from widgets for example, the SEO super comment version of this comment will only get one automated link from the article it’s attached to. So this is deep content with just one link, pretty impressive for so little PR/link benefit passed. 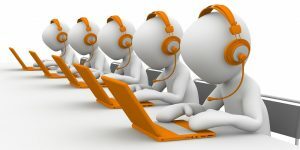 If you want more SEO add links manually like I have above with the Thesis review link.